Six authors coming together and providing short stories for an anthology. Six short stories filled with passion and healing. 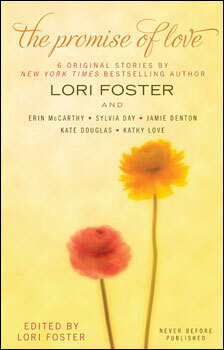 The Promise of Love is an anthology of six romances written to support a charity. Mark Connor had finally escaped. His apartment, his career, the chains that had shackled him to a stagnant life. He was finally returning to the haven he had discovered. A place his star author, and friend, had gone. Granted he wasn't expecting the same results - love and a couple kids - but there was something about these Colorado ranches that called to him. It was more than the calluses, saddle sores and visitors at the dude ranch. It was being able to be at peace with the man he was... and maybe a chance to have a future with Betsy Mae Twigg. Betsy Mae couldn't believe it. Her brother and sister-in-law had just abandoned her when she returned home. Granted they could use a vacation from their dude ranch, but Betsy Mae needed help. Luckily Mark showed up on their doorstep and she was more than willing to put that city boy to work. As he put in long hours and never complained, Betsy Mae knew there was more to Mark than good looks. Unfortunately, she also knew he was only going to be there for a short while, so a long term relationship was out. Dime Store Cowboy was a western romance with heart. Betsy Mae had been in an abusive relationship and escaped home. She didn't expect her future to be in the form of a New York city slicker, but Mark quickly proved that he was more than a polished veneer. Mark had been looking west for a long time, and it was wonderful watching him shrug off the confines of his past and embrace his future. Dime Store Cowboy is actually the sequel to Cowboy In My Pocket where Mark came out west when his star author had found her love. Included in The Promise of Love are: Shelter From the Storm by Lori Foster, Take Me Home by Erin McCarthy, Razor's Edge by Sylvia Day, Midnight Rendezvous by Jamie Denton, Dime Store Cowboy by Kate Douglas, and Life in the Past Lane by Kathy Love.